Merit Badge Program - A special part of a Scout's learning adventure, merit badges are awards presented to a Scout when he completes the requirements for one of the merit badge subjects. There are more than 100 merit badges a Scout may earn. The subject matters range from vocational and career introduction to personal development, hobbies, sports, high adventure, citizenship, and life-skills development. 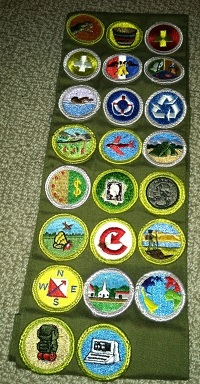 Benefits: There is more to merit badges than simply providing opportunities to learn skills. There is more to them than an introduction to lifetime hobbies, or the inspiration to pursue a career—though these invaluable results occur regularly. The uncomplicated process — beginning in a discussion with a Scoutmaster, continuing through meetings with a counselor, and culminating in advancement and recognition — provides several learning experiences. It gives a Scout the confidence achieved through overcoming obstacles. Social skills improve. Self-reliance develops. Examples are set and followed. And fields of study and interest are explored beyond the limits of the school classroom.